The superhit song from veteran Malayalam actor Mohanlal's latest film 'Velipadinte Pusthakam' is insanely viral on social media. The Jimikki Kammal craze is anything but over. The song Entammede Jimikki Kammal, which roughly translates to "My mother's earring," is a viral sensation, with over 22 million views on YouTube. 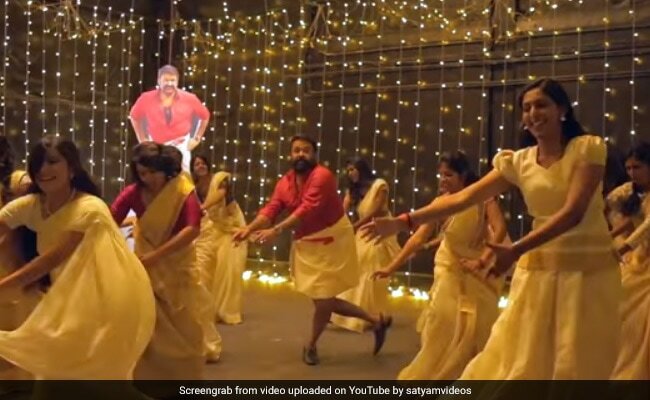 The song from South superstar Mohanlal's latest film, Velipadinte Pusthakam, has spawned hundreds of tributes from fans taking the Jimikki Kammal dance challenge. From college students to techies, fans have been flooding the Internet with their well-choreographed dance performances, many of which have millions of views on YouTube. And now, as a thank you of sorts, the star himself has taken the Jimikki Kammal dance challenge. That's right! Mohanlal posted a video of himself taking the dance challenge on social media on Sunday and it's already viral. With over 4.5 million views (and counting) on Facebook, the video of Mohanlal shaking a leg to the catchy beat is getting lots of love from fans. "The song that has got everybody dancing have made me too to take a few steps (sic)," writes the actor on Facebook. "Here's my version of #JimikkiKammal with the participants of dance challenge, and team Velipadinte Pusthakam." Lalettan, as the actor is referred to by his legions of fans, dances up a storm in a bright red shirt and mundu, which he tucks up with gusto. The video, which was posted on Facebook 15 hours before writing this, has already been shared over 86,000 times and collected over 1.6 lakh reactions. The Internet's verdict? Super-duper hit! American talk show host Jimmy Kimmel tweeted recently that he "loves" the song Jimikki Kammal as well.